I guess I might be putting myself out there a little by talking about an application that is not yet been accepted, nor has the entrance into the program been awarded to me but I guess I wanted to share with you all the exciting things that are transpiring (aside from planning a wedding). Let me start over. A couple of weeks ago, we went over beading samples and hand stitches in class. For the most part, these are things that I am extremely comfortable with. I have embroidered and the like in the past. In walking around class, the girl next to me brought the instructor over to look at what I had been working on. I would say that she was impressed, well, because she said she was. Cut to the end of class. Teach was doing attendance and also asking who was in the Design program. Pretty much everyone but me said that they were. When she asked me why I wasn't, I told her that as I understood it, that I couldn't apply until I had completed a class (and all the garble that I thought I read correctly online). Come to find out, I could have applied to the program at any time that I wanted. "Oh but there is still time to apply this semester!" cried the class in unison. Still time? Here it was March 20th and applications had to be received by April 1st. But you know what? I decided I was going to try to do it. Fast forward a week later and I had written (and re-written) my statement of purpose, filled out my application, called my schools for transcripts and created a collage that helped the admissions committee see what fashion inspired me and what direction that I planned to go in. 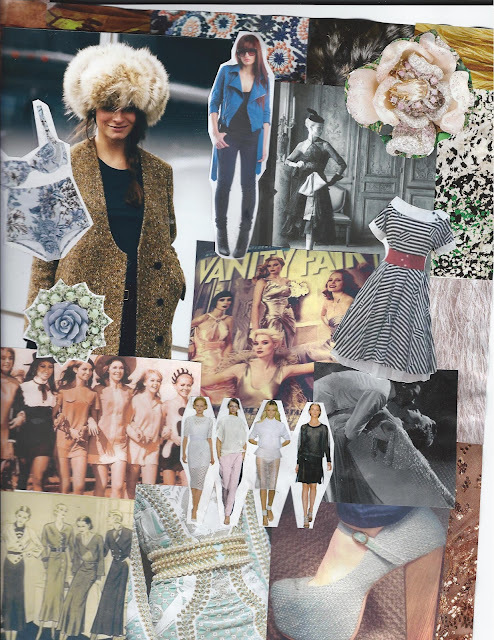 Here is a snippet from my collage (which, yes, was crookedly scanned for this post and therefore isn't as impressive when scanned) which I spun to represent the details I would put in my designs, the inspiration that I draw from vintage looks and the edge that I would add so that any woman could incorporate one of my pieces into street wear. I discussed textures (leather, feathers, brocade, fur and more) and the details (beading, adornments and accents) that I would include that would make women feel like they are apart of something special. I did my best, to express in a very short amount of time, what I would bring to the program. During one of the busiest weeks of my recent months, I pulled together, what I considered, to be a pretty solid application package for this program. I don't know how long it will take for them to get back to me and who knows if the news will be good but I am 100% positive that even if I don't get in this semester, I will try again in the Fall. This is something that I need to do and I just hope that the admissions committee will see that I am passionate and ready for any challenges they have. ...And yes, I will let you guys know even if I don't get in.